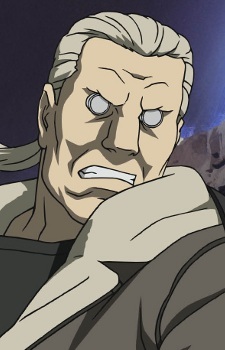 Batou (also Batto, Bato) is nominally the second-in-command of Section 9. Little is known about the strange, large foreigner who has been with Motoko Kusanagi for years. He was once American and served in the Special Forces in South America. His amount of cyborg-ization is variable according to the storyline, from his limbs only up to most of his body, second only to the Major herself. Despite the availability of superior eyes, he grew superstitious about his old-style eye replacements, popular with many high-level military operatives. He also retains some residual body-image issues, causing him to continually purchase workout equipment despite the obvious anachronism.